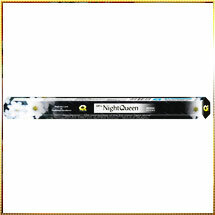 Our Night Queen Incense Stick releases soothing and stimulating fragrances that linger for long hours. Its pleasing fragrance is deeply admired by one and all. Commonly used in rituals, our Night Queen fragrance incense sticks intensify the ceremonial environment with purity. These night queen scented sticks, when burned, heighten the meditative experience enabling one to focus on God. Besides, the sticks are widely demanded by spa owners and therapeutic centers for infusing their surroundings with enlightening fragrance. Made using premium aromatic and biotic ingredients combined with essential oils, our Night Queen flower flavored incense sticks are available in varied sizes as per the requirements of the clients.